This "Wine Cellar" tapestry is based on the work of artist Emily Adams. Here we see a glass of red with a wine bottle in a rustic style. Her poster like pieces create an old world charm that brings an easiness and quaintness to their pieces. Here, this tapestry can be used to celebrate wine making and collecting, and can be used in a kitchen or wine cellar itself. The use of color is simple and cohesive with the reds complimenting the beige and subtle yellows. 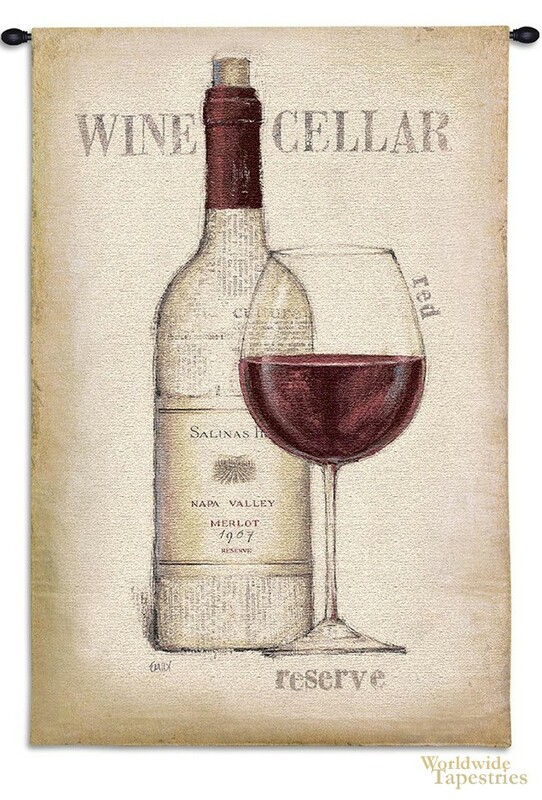 This art tapestry "Wine Cellar" is backed with a lining and has a tunnel for easy hanging. Note: tapestry rod and tassels, where pictured, are not included in the price.